Experience the soothing comfort and tranquil design of the Coastal - Serin Freestanding Tub from American Standard. Sink into its deep design and relax in sophisticated style. Bring a heightened sense of personal luxury to your bath. The Coastal - Serin Freestanding Tub is made of lustrous and durable cast acrylic. Rejuvenate, relax and renew your spirit in the Sedona Loft Freestanding Tub from American Standard. Spaciously designed for deep soaking comfort. Its deep soak design and simple style bring soul-enriching comfort and peaceful beauty to any bathroom. This modern freestanding tub is made of lustrous and durable cast acrylic. The Muse soaking tub finds inspiration in minimalism without sacrificing comfort. Crafted from acrylic solid solid surface, Muse envelopes you in a warmth retaining basin that will relax your body and rejuvenate your spirit. Muse's elegant freestanding profile pleases the senses and will turn your blah bathroom into an exquisite spa. Bathe in beauty with Muse. Mermaid 5.92 ft. Centre Drain Soaking Tub in White Full-sized, full-immersion soaking is yours with the Mermaid 5.92 ft. Centre Drain Soaking Tub in White. A chic rounded design and bright white finish produce a dramatic effect on this freestanding bathtub, sure to enrich your bathroom ambience and leave a lasting impression. The acrylic construction is strong, light and warmer to the touch than typical steel or enamel tubs, allowing for easy installs and heat-retaining soaks. Overflow and drain outlets in a brushed nickel finish are included to complete the setup. 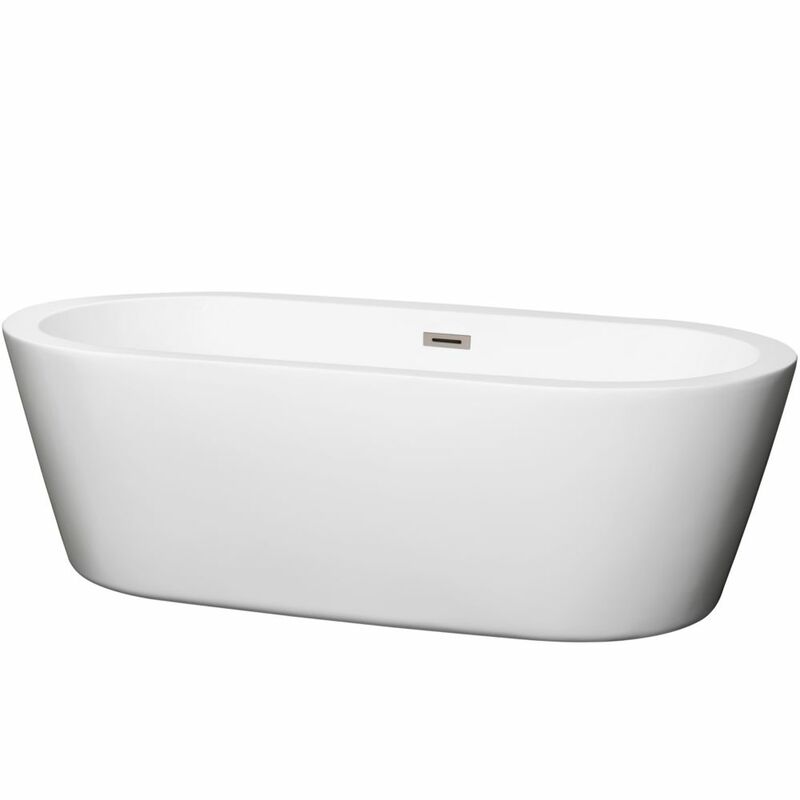 Mermaid 5.92 ft. Centre Drain Soaking Tub in White is rated 4.3 out of 5 by 3. Rated 5 out of 5 by Anonymous from Beautiful I wanted a semi modern tub and this was perfect!!! It wasn't too round nor square just the perfect balance. Oh and it's functional too lol.